A Piece of our family history: the Battle of Petäjäsaari 1940. As a celebration of the #Finland100 I decided to write about a small but personal piece of Finnish history. A few years ago my mother asked me to find out what exactly happened to her uncle Sulo, who had disappeared during the Second World War. She knew that it had happened at the end of the Winter War in 1940, but nothing else. She gave me his full name, rough time of birth and a copy of his last letter. In that letter he wrote that he had just arrived as fresh reinforcement to a new unit. Armed with this information I started to dig some archives and uncovered the date of Sulo's demise, only three days after the last letter was dated. The same source revealed the unit he had served in and the place of his disappearance. Another archive hosted the war diaries of the different Finnish military units, so I dug out the diary of the 6th company of the 35th infantry regiment, that Sulo had served in. On the very day my great uncles last letter was dated, there is actually a mention in the diary that the company commander went to meet the new reinforcements arriving to the island they were defending. This kind of work has now been made very easy and accessible as most of the Finnish military records, pictures and war diaries from the World War Two have been collected into a single portal called Sotasampo as part of the Finland100 celebrations. Inspired by the events and the sacrifice of the Finnish soldiers during the last battle of Petäjäsaari, I decided to write a short story about these, often overlooked events. Following chapters are based on historical evidence and eyewitness accounts. 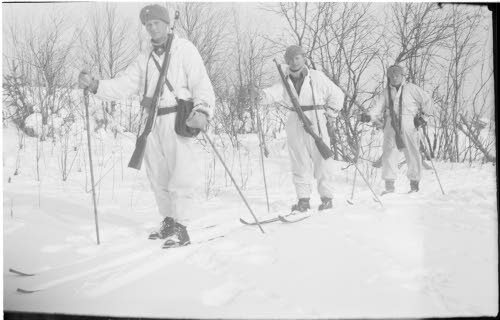 On the darkening afternoon of the 29.02.1940 the Commander of the 6th company of the 35th Infantry Regiment had skied across the frozen lake to the battalion HQ at Vuoratsu, after receiving a message that the high command could spare a few fresh men to reinforce his battered company. The 6th company had held the Petäjäsaari-Island for weeks now. Operation that begun as an offensive to cut out the flow of supplies that were keeping the encircled Soviet 168th division alive had now reversed into a desperate defense to hold out the 80 000 men strong Russian relief force, that was threatening to break through the frozen lake Ladoga archipelago and flank the Finnish main defensive line. The glory of the initial success, such as the destruction of a 400 horse supply column in a single night, had dimmed as the situation looked more and more desperate. The Island was now defended by the 60 remaining men of the 6th company. They had been reinforced by an aged anti-tank gun, a mortar platoon, two machine gun platoons and some combat engineers. Altogether some 220 tired men were mostly ready to stand against the red tide. He wondered if the unusually quiet day with only sporadic mortar fire was just a calm before yet another storm. 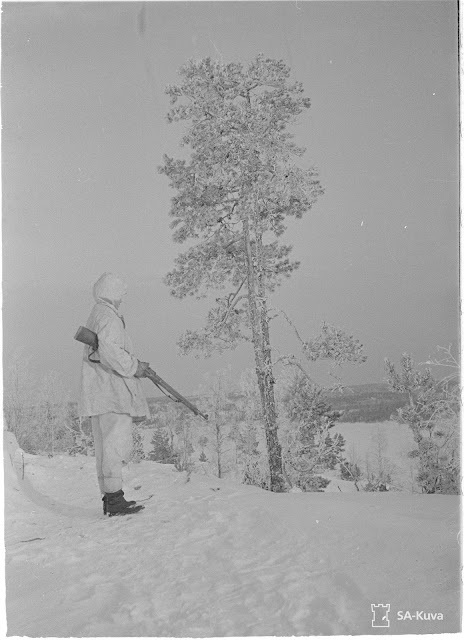 On the other hand the previous night had been a rough one, with continuous fire from mortars and cannons keeping the Finnish soldiers awake all night long. Sulo and the rest of the reinforcements stood in the snow out side of the command tent with a variety of Mosin-Nagant rifles slung across their backs. Some of them were still stuffing their mess kits back to the rucksacks. The company commander, a 29 years old reserve lieutenant, ordered his new men to grab their gear and skis and follow him. Lt. Suhonen was still steaming after a confrontation with the divisional headquarters. He had repeatedly asked for a permission to abandon the island he saw impossible to hold for any longer. The Soviet relief force had simply grown too large to hold. As his last attempt, the lieutenant had offered to personally stay at the island if his men could be withdrawn in to the mainland front line. His pleas were ignored by the over stressed division, that still hoped to keep the position and destroy the Soviet 168th division to the last man. The small group glided down the steep slope to the snowy ice covering the lake Ladoga. Crossing the open ice didn’t take long from the experienced skiers. The shores of the Petäjäsaari were rocky and steep, with some of the cliffs extending all the way to the shore. The once tall pines, that had given the island its name, had been shattered by the Russian artillery and bombers that had pounded the small island for weeks. After dropping their rucksacks to the warm tents the newcomers were scattered to the depleted infantry squads. The following nights were a calm and days mostly spent repelling Russian probing attacks, but precisely 6.30 in the morning on 6th of March 1940 the Russian artillery opened up with all its might. Dozens of field guns and howitzers targeted the Island. Soon the mortars and infantry guns in the nearby Russian controlled Islands opened up. 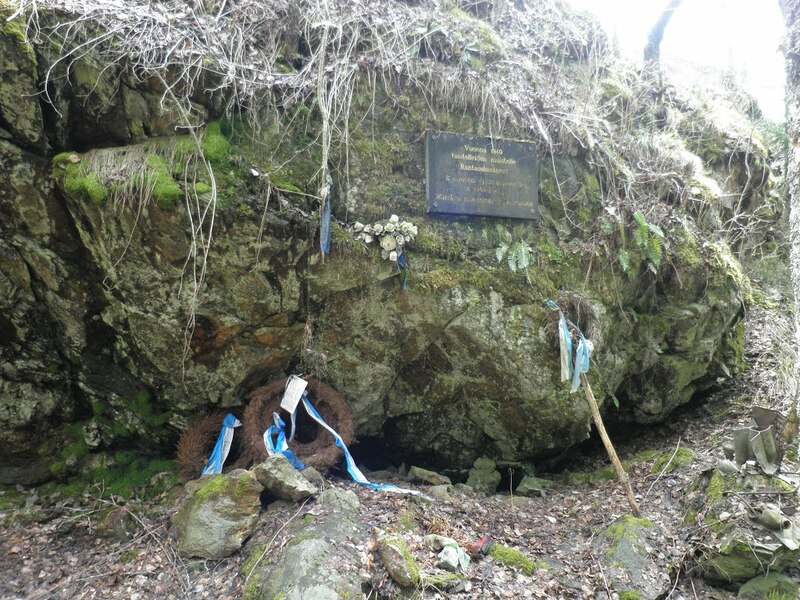 The Finnish casualties started to pile up and the wounded were gathered beneath a great cliff, waiting to be evacuated. After the initial barrage the Soviet Air Force joined the bombardment. The fighters and the attack aircraft strafed the defenders with their machine guns over and over again. Shrapnel from the bombs and shells ricocheted between the rocks and cliffs. At the southernmost tip of the Island sergeant Savolainen is laying behind his M/32-33 with twelve full belts waiting besides his loaders. As the crew peaked between the granite boulders at the shoreline they saw that the Russian army had started their advance towards Petäjäsaari. Thousands of men moved behind a wall of sixty tanks. The tanks, mostly T-26:s and BT:s, encircled the island from three sides and started firing with their cannons and machine guns. Sgt. Savolainen lifted his head up and lined the sights of his gun towards the main Russian force squeezing the trigger plate. The rapid firing gun opened up and started cutting down the invaders that tried to cross the open ice. Alerted by the peculiar sound of the Finnish Maxim the rest of the 220 defenders sprung up and started the desperate fight for survival. All of the Finnish machine guns fired as long as they either ran out of ammunition, the crew was dead or as was he case with Sgt. 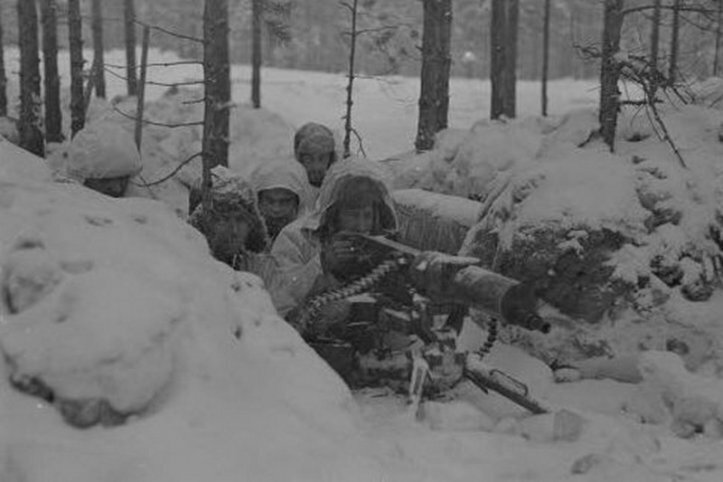 Savolainen’s gun, their barrels failed from overheating despite the freezing cold. Savolainen looked around and saw most of his men lying dead and ordered the remaining two to fall back. As they crawled towards the hill-top, where Finnish machine guns were still firing, they turned and fired their rifles at the advancing Soviets. After just a few meters a machine gun burst from an T-26 caught the trio, killing the two loaders instantly. Sgt. Savolainen caught a burst to his left arm, that sent him rolling down the hill. After regaining his bearings he hastily bandaged his arm and continued to desperately crawl towards the small log pit that was hidden by the tall cliff. The hastily built fortification was used as a dressing station,where the wounded waited for their evacuation. The relentless artillery barrage had broken all the phone lines and every squad fought independently. Disregarding the enormous casualties they were sustaining the Russians managed to reach the shoreline. Several tanks burned on the ice as the Finnish anti-tank gun knocked them out. At the same time the first Russians reached the shore, a lucky mortar shell disabled the sole cannon in the island. Luckily the Soviet tanks were unable enter the Island as the rocky shores proved to be impassable for the light and fragile vehicles. Just as the bleeding sergeant got close enough to see the medics pulling an unconscious Sulo into the safety of the log pit, the Russian heavy artillery struck the hill with dozens of guns. Immediately after the artillery strike a flight of SB-2 bombers dropped their heavy bombs to the still shaking hill. The ground trembled and waved from the power of the explosions. As the freezing wind blew the thick bitter smoke clouds away, the entire face of the cliff had collapsed and the entire dressing station and all of the wounded and medics had disappeared beneath the rumbling tons of stone. The company commander lt. Suhonen shouted an order retreat to the mainland to all of the wounded soldiers gathering at the collapsed cliff. He then grabbed his Suomi kp-/31 sub-machine gun ran to the nearest circular position made from head sized rocks and began firing at the Russians climbing over the rocks at the shallow valley dividing the island. After sgt Savolainen had reached the western shore of Petäjäsaari and found a pair of skis tucked between the rocks. He managed to secure the skis to his boots and started to ski one handedly towards the coast and safety. Artillery shells pierced the ice around him, splashing ice cold water to his torn white snow suit. Soviet fighter planes began to strafe even the individual soldiers crossing the mile wide ice. 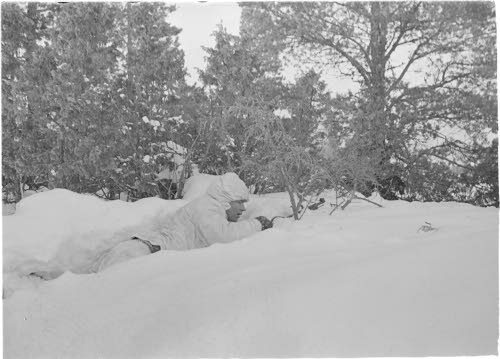 Sgt Savolainen managed to reach the shore near Vuoratsu and stumbled to the Finnish front line, where the soldiers watched helplessly at the carnage unfolding before them. Only a handful of the 220 Finnish soldiers survived from Petäjäsaari, the last ones crawled over the ice during the night after hiding among the dead. Soldiers at the main defense line heard random gunfire all through the night as the Soviet invaders slaughtered the Finnish wounded that were left behind. The scarred remains of the 6th company stayed at the front lines until the end of the war. Company had lost 95 % of its men and thus became the unit that sustained the heaviest casualties during the Winter War. 46 of the Finnish soldiers that died during the battle of Petäjäsaari, were from the same tiny village of Rantasalmi. This battles demonstrates the spirit and courage of the Finnish soldiers. They were willing to fight until the bitter end against impossible odds. This spirit still lives on among the Finnish soldiers, conscripts and reservists. 100 years old Finland is a nation worth fighting for! More about the battle at Kansa Taisteli-magazine. My favorite book about the Winter War. Great article. I completely love this blog. Keep sharing content like this. Also click here Brian Bissonnette to see similar content.